Cut the bread into chunks. Drizzle with olive oil and bake for 15 minutes until crunchy. Place the peppers onto a baking tray and drizzle with olive oil. Place in the oven for 20 minutes until blackened. Remove from the oven and whilst the peppers are still hot place them in a heat proof bowl and cover with cling film. Allow the peppers to cool and this will loosen the skin. When the peppers are cool enough to handle remove the skins and the seeds and cut the flesh into slices. Remove the skins from the tomatoes by cutting a shallow cross into the bottom of each. Drop them into boiling water for 15 seconds. Remove the tomatoes from the boiling water and immediately plunge them into a bowl of iced water. Peel the skins off the tomatoes and then cut the tomatoes into quarters. Slice the mozzarella balls into 6 slices each. Make the dressing whisk together the red wine vinegar and garlic and add 150 ml of olive oil. Season with salt and pepper. Pour half of the dressing over the chunks of bread and pour the rest over the peppers and tomatoes. Add the chilli, capers, olives and basil to the peppers and the chopped tomatoes. Finally add the rocket leaves. 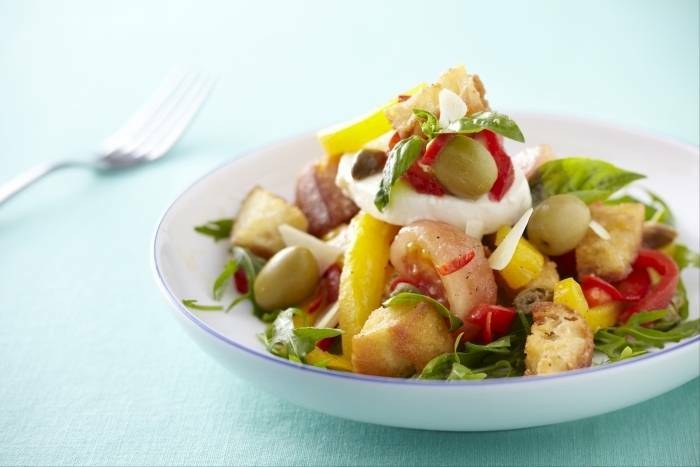 Place a pile of the panzanella salad in the middle of a plate, top with the sliced mozzarella, finish with a drizzle of any remaining dressing and the chunks of bread soaked in dressing.